I’m in love with Hard Grove Cafe and think it is highly underestimated. Any night of the week, you can be transported to an island. Seriously, with the music, ambiance, and tropical cocktails, you will not feel like you’re in Jersey City. It’s vivacious, though, so just be sure you are in that lively-crowd type of mood. A few weeks ago, I was there for dinner for the first time (I’d only been there for drinks before), and though online reviews said the service was terrible and my dining companion was apprehensive, both of us totally disagree after the experience. Perhaps that is because we have European roots and like a slow pace of life. I absolutely hate being rushed at restaurants. If my food comes out 10 minutes after I placed my order, I am turned off. At Hard Grove, the food came out after our first drink and before our second…perfect timing. As a side note, I eat dinner late, so this was 10pm, but our server was really attentive without rushing us or making us feel uncomfortable. The bar was hopping, though we were on the “table side,” a nice separation, the atmosphere was bustling, and no one was in a hurry to leave. I like it when we can savor times to relax, especially when spending a pretty penny. You want your time to unwind and enjoy a lovely meal as quickly or as slowly you’d like. Last week, I had dinner there again outside on one of the nice-weather days, and they let us linger for as long as we wanted after our meal. This place is fresh and local—the real deal. 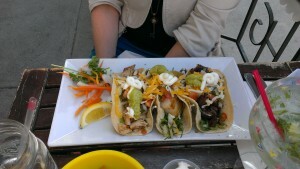 As for the food, the first time we ordered the taco trio to split. Three Soft Flour Tacos of Grilled marinated Skirt Steak, Fish & Chicken, each with lettuce, tomato, cheese, guacamole, sour cream, and salsa. It was enough food for two with the chips—the fresh, deep fried kind—and salsa come that with your meal. The fish is definitely my favorite, but all are well-flavored and delicious. One note: the menu says they are flour tacos but when I ordered them again on my next visit, they were corn tacos. Make sure to ask if you have a preference. Next time, my date ordered the golden empanada trio and picked beef, chicken, and spinach & cheese as his fillings. No complaints there. 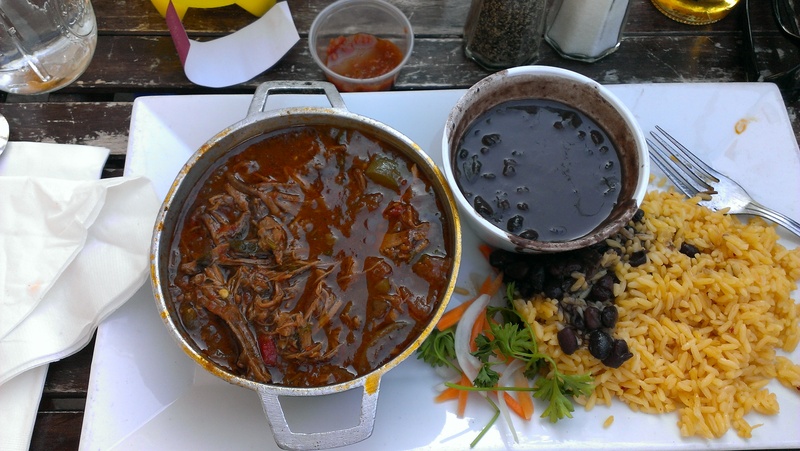 Same for the Ropa Vieja (shredded Beef in savory Sofrito sauce), which was seasoned well and melted in your mouth. I’ve also had the yuca fries which are pretty standard. They’re served with a nice garlic aioli sauce. 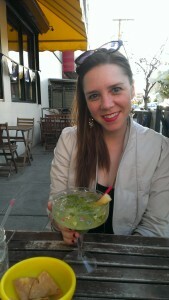 For drinks, I had the Mojito Margarita. I like margaritas, and mojitos tend to be more bland for me (or I’m not a huge fan of mint drinks), but it was the perfect day to try this combo, as their drinks are potent and I didn’t want anything too sweet, especially while sitting in the sun(set). They do garnish it with a sugar cane, but I found the drink to be not-too-sweet, not-too-mint, and a perfectly refreshing complement to my meal. Last year, I stopped by Hard Grove on Cinco de Mayo, and this year made it my point to go back on that holiday.